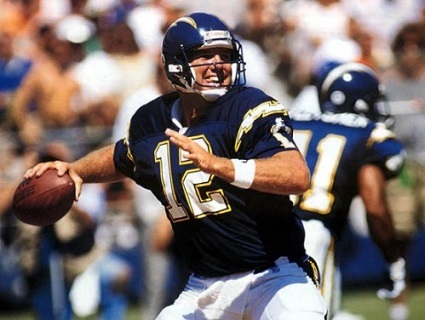 On August 13, 1992 the San Diego Chargers, in need of help at quarterback, obtained QB Stan Humphries from the Washington Redskins for a conditional 1993 draft choice. The condition was that, if Humphries took at least half the snaps during the ‘92 season, Washington would get a choice in the third round, as opposed to a fourth-round pick (It ended up being a third-round selection used to take Ed Bunn, a punter out of Texas-El Paso, who failed to make the club). The 27-year-old Humphries had starred in college at Northeast Louisiana, which won the Division I-AA national championship with him behind center. The Redskins chose him in the sixth round of the 1988 NFL draft and, while impressed with his size (6’2”, 223) and arm, he was stuck as a backup behind Mark Rypien. The failure of the pudgy quarterback to commit to offseason conditioning soured Head Coach Joe Gibbs on him and it didn’t help when he got a chance to start in place of the injured Rypien for five games in 1990 and was highly inconsistent. He saw no action at all during the 1991 season that culminated in a NFL Championship. Rypien, who was outstanding during the title campaign, was a training camp holdout but signed just prior to Humphries being traded. San Diego had gone 10-22 in the previous two years, including 4-12 in 1991, and Bobby Ross was replacing Dan Henning as head coach. QB John Friesz showed some promise, but suffered a knee injury in the first preseason game that required surgery, and backups Bob Gagliano and Jeff Graham were mediocre. Ex-Washington GM Bobby Beathard was now the general manager of the Chargers and swung the deal for Humphries. Humphries took over the starting job and, after a slow start, performed well. Adept at play-action and an able down-field passer with a quick release, which made up for a lack of mobility, he supplemented his physical abilities with strong leadership and toughness. The Chargers lost their first four games, but went 11-1 the rest of the way to improve to 11-5, winning the AFC West and advancing into the playoffs. They made it to the Divisional round with Humphries remaining behind center despite playing with a shoulder separation. Overall, Humphries passed for 3356 yards with 16 touchdowns and 18 interceptions, although eight of the pickoffs came in those first four losing games. Humphries got off to a rough start in 1993 due to a shoulder injury during the preseason that affected his throwing ability and he lost his starting job to Friesz for six games at midseason. Four of those games were losses, however, and Humphries returned to the starting lineup. The team went 4-2, on the way to an 8-8 finish, with Humphries back behind center, and in one of the losses he was knocked out of the game due to a concussion. Overall, he passed for 1981 yards and 12 TDs against 10 interceptions, with 520 of those yards and five touchdowns coming in the final two contests. The stage was set for Humphries and San Diego to rebound in 1994. The Chargers won their first six games on the way to topping the division with an 11-5 record. Humphries suffered hip, knee, ankle, thumb, and (non-throwing) elbow injuries along the way, but missed only one game while also showing greater savvy as a quarterback and guiding the club to six fourth quarter game-winning drives. He threw for 3209 yards while completing 58.3 percent of his passes, with 17 touchdowns and 12 interceptions for a career-high passer rating of 81.6 and again provided effective leadership. In the postseason, the team won two games, including an upset of the Steelers in Pittsburgh for the AFC Championship, although the Chargers foundered in the Super Bowl against the San Francisco 49ers. Still, it was San Diego’s first Super Bowl appearance and a career-year for the stocky quarterback. Humphries remained with the Chargers for another three seasons, with diminishing returns. While he passed for a career-high 3381 yards and another 17 TDs, the training camp holdout of star RB Natrone Means damaged the offense, as well as team morale, and while San Diego again reached the playoffs, it was as a Wild Card entry with a lesser 9-7 tally. The Chargers were eliminated in the first round. San Diego slipped further to 8-8 in 1996 and injuries became more of a factor for Humphries, who missed three games although he also achieved a career high with 18 touchdown passes. He lasted just eight more games in ’97, and retired after suffering several concussions. Overall with the Chargers, Humphries completed 56.8 percent of his passes for 16,085 yards and 85 TDs, totals only excelled up to that time in franchise history by Dan Fouts and John Hadl, while giving up 73 interceptions. The team went 47-29 during his starts, plus 3-3 in the postseason.